Still need some last-minute Easter cards, decorations, or activities? 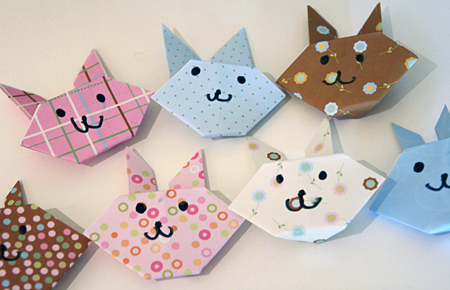 Try making these simple origami bunnies! We followed these directions at Activity Village – they have nice clear photos showing the steps. We used 6-inch squares of scrapbooking paper (regular-weight, not cardstock). My six-year-old memorized the instructions after one time, and continued to make a whole bunch more on her own. My four-year-old and I worked together to do the folding. 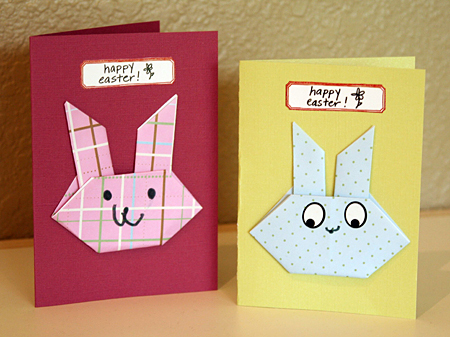 These sweet bunnies also look great on the front of a card — I recommend using glue dots or double-stick tape to attach. We also made some tiny bunnies using 3-inch squares, which would be really cute on little gift tags. Natalie plans to attach some of her bunnies to craft sticks to make bookmarks for her cousins, too. I’m off to cut some more paper squares — these girls are bunny-crazy! Great bunnies, thank you so much. You do have some marvelous ideas. There’s a link in the post to download the pdf directions from Activity Village. Have fun!